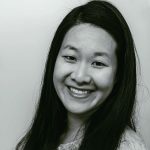 Published Jul 31, 2017 By Julia Leave a CommentThis post may contain affiliate links. 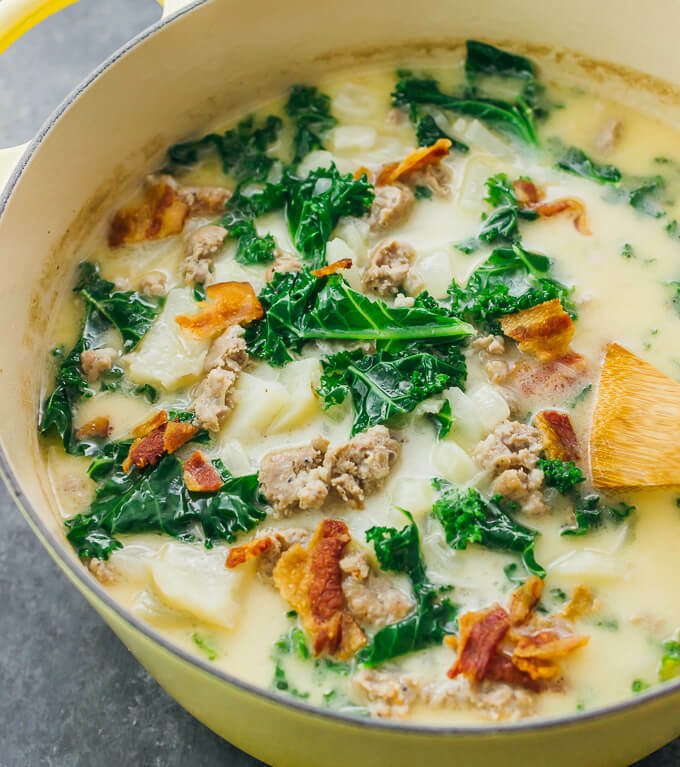 Zuppa toscana or “Tuscan soup” is a comforting Italian soup with kale, potatoes, onions, cream, and garlic. 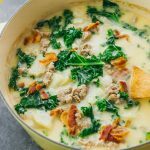 I think of zuppa toscana as “a potato soup with sausage, bacon, and kale,” which isn’t wildly different from the classic version made in Italy that also included zucchini, cannellini beans, celery, and tomato puree. 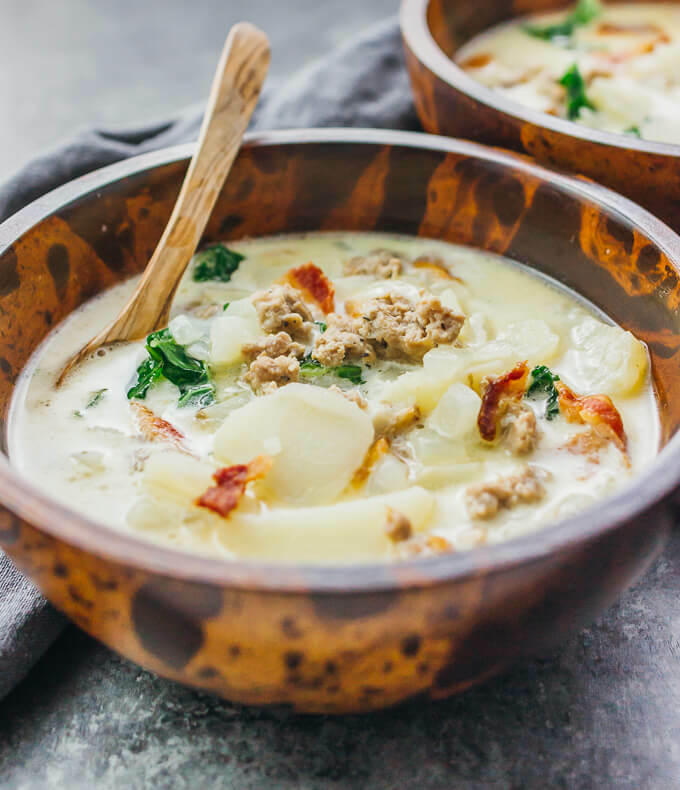 Nowadays, most Americans know of zuppa toscana as the soup perpetuated by Olive Garden, and it has become increasingly popular over the years. It has more flavors and textures than your average potato soup, and is overall a very comforting meal. You can also add some heat to the dish if you opt for hot Italian sausage or add red pepper flakes. 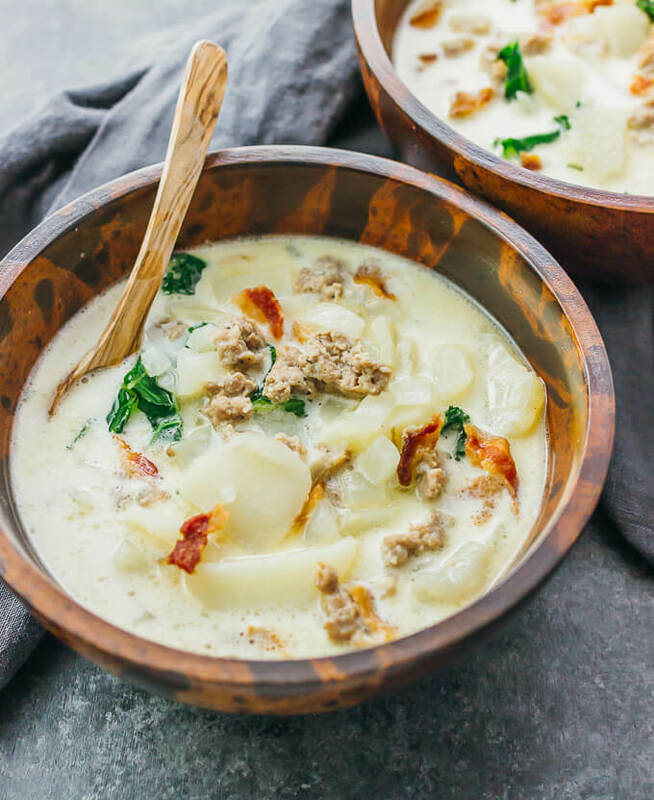 I wanted to try out zuppa toscana for myself, and since I don’t live anywhere near an Olive Garden, I decided to make it by adapting this recipe from Food.com. I kept all of the basic ingredients the same, but made a few adjustments, including increasing the number of potatoes so that the soup is on the heartier side, and adding more garlic — this is practically mandatory for almost every recipe I adapt. I also fry the bacon in the same pot as the first step of the recipe. 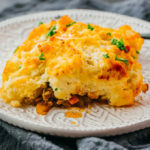 How can I make a low-carb version? You can replace the potatoes with cauliflower. It will affect the texture of the resulting dish and the cooking time, but it’s the closest thing you’ll come to a lower carb version of this soup. I’m tired of potatoes. How about something else? I can think of a lot of delicious potato substitutions, such as pesto or cheese filled tortellini, or gnocchi. 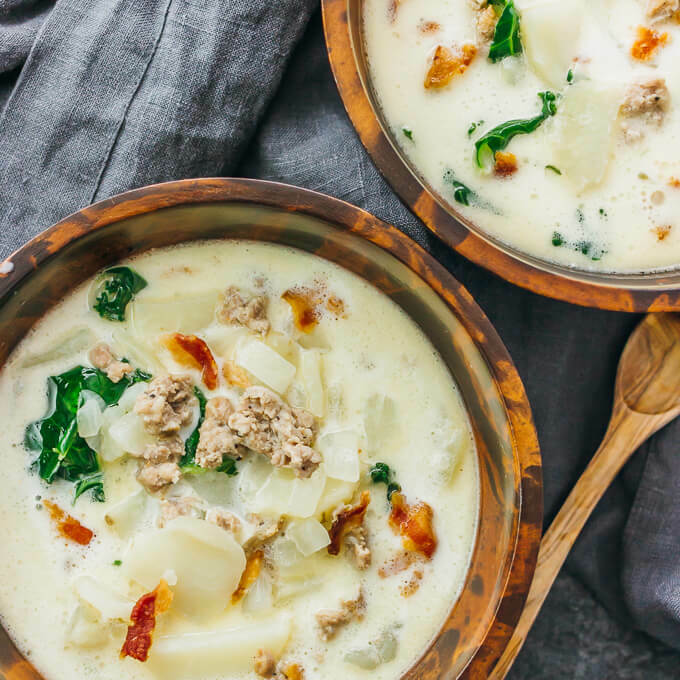 Any of these would be a delicious twist on zuppa toscana. I don’t do kale. I usually don’t either, but kale tastes fantastic in zuppa toscana. If the kale isn’t working for you, you can substitute with spinach. What can I use instead of heavy cream? It’s not going to taste the same without heavy cream. If you’re willing to sacrifice on taste, you can substitute with half and half or full-fat coconut milk. I ran out of corn starch. Help? 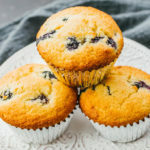 Flour can be used as a thickener and can replace corn starch in the recipe. 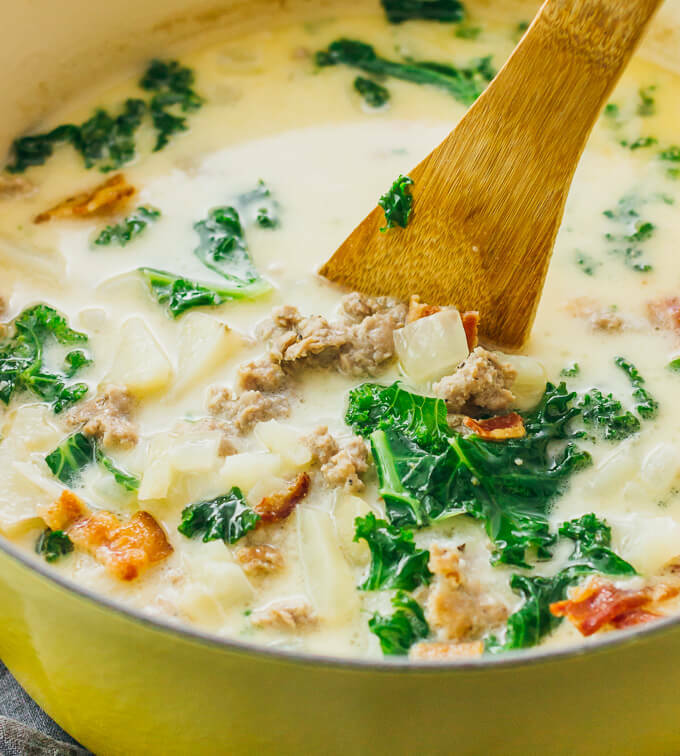 Zuppa toscana or "Tuscan soup" is a comforting Italian soup with kale, potatoes, onions, cream, and garlic. Add bacon to a 6 quart or larger dutch oven over medium heat. 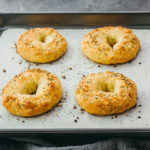 Cook until crispy, 10 to 15 minutes, turning occasionally to evenly crisp. Transfer bacon to a paper towel to drain. When cool, crumble into small pieces. Add sausage and cook over medium heat, breaking it apart until crumbled and browned, about 5 minutes. Add onions, garlic, salt, and pepper. Cook until the onions are fragrant, a few minutes, stirring occasionally. Add potatoes, chicken stock, and water. Bring to a boil over high heat, then reduce to medium heat to maintain a simmer. Mix corn starch with 2 tablespoons of liquid from the pot to make a paste-like mixture. Add the corn starch mixture to the pot and stir together. Simmer for another 10 minutes, stirring occasionally. Verify that the potatoes are tender. Remove from heat. Add kale and cream, stirring together. Top with crumbled bacon and serve.